44 Hotels, 6 Guest Houses, 3 Cottages, 2 Bed and Breakfasts, 2 Apartments and 1 Inn. The Yacht Inn, located in St Peter Port, the capital of Guernsey, overlooks the Albert Marina and Castle Cornet and offers recently refurbished, well appointed bedrooms, a restaurant and bar. The bedrooms at Yacht Inn mix new lines and comfort with recently refurbished surroundings, whilst the restaurant offers Mediterranean flavour dishes in a friendly atmosphere. 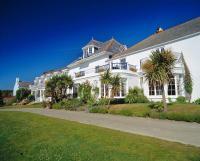 L'Eree Bay Hotel in St Peters overlooks the picturesque bay of L'Eree. A bus stop is just outside the hotel. This friendly 2 star hotel has 37 bedrooms including family and ground floor rooms. Most have sea views and all are en-suite with tea/coffee trays, hairdryers, flat screen TV/DVD. Brasserie style restaurant uses local produce such as fish & shellfish in the wide selection of meals with daily specials board too. The 4 star Bella Luce Hotel & Spa, a Norman manor house from the 12th century, is in a stunning rural location in St Martins, Guernsey. An exceptional luxury boutique hotel which mixes old fashioned with luxury contemporary design, it is unlike any other hotel in Guernsey. There are 12 Standard Rooms, all stylish and en-suite, 6 Premier Rooms and the ultimate - 6 Luxury Rooms. Award-winning restaurant. The Pandora Hotel in Guernsey is a period-built house located just a ten minute walk from the centre of St Peter Port and next door to Victor Hugo's house - a great hotel for sight-seeing in Guernsey. The elevated position give superb views which can be appreciated from some of the 55 en-suite bedrooms. The Sunflower Restaurant offers varied continental cuisine and a fine selection of wines. Hill Crest was originally two cottages that were long ago combined into a spacious home with all of the latest conveniences. The original cottages were built over two hundred years ago to house workers from a nearby granite quarry which is no longer in operation. We have a large conservatory, where breakfast is served whilst looking out over the magnificent views.